During our last trip to Warsaw, our annual Alternative Education Program end of the year trip, we were introduced to Warsaw Bauhaus, a local organism cultivating progressive alternatives to the art world, involving all disciplines. It was an impromptu late night meeting at the end of a full day. 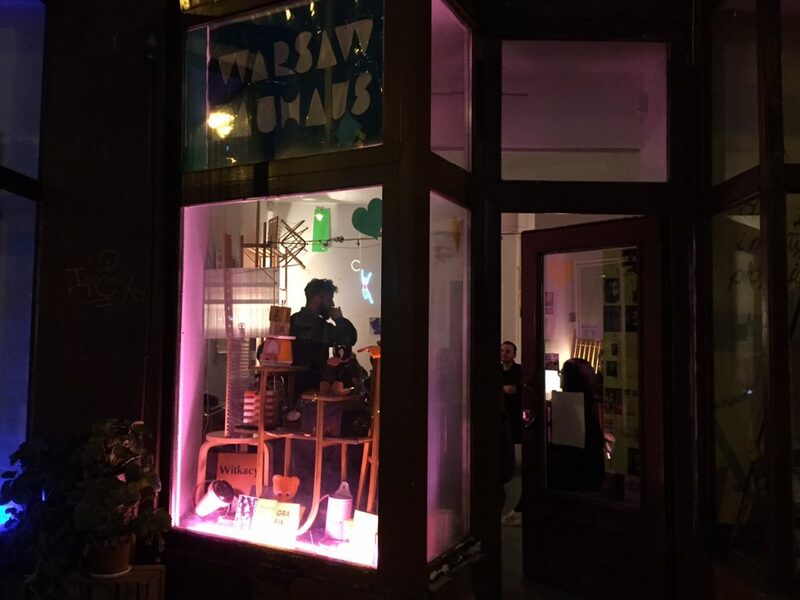 We reached their intimate vitrine space on Dobra street 15, across from a blazing neon copy of „the fine action of a woman throwing a volleyball“ or „Siatkarka“ (designed by Jan Mucharski in 1960 and restored by Paulina Ołowska in 2006) and were introduced to an array of design objects from the 60s and 70s, old copies of Projekt magazine and Ubu posters, among many other wonders. Joanna and Wojtek spoke to us about Warsaw Bauhaus and the meetings they regularly host there and soon there was an idea for a gathering. Julijus (Balčikonis) had brought with him two 8mm rolls of film with footage from visits to fabric factories and other places in Warsaw, Gdansk, Sopot as well as other places in Poland, captured by his grandfather Juozas Balčikonis during his trip to Poland in the 60s. Julijus had also brought with him a portable projector. The films originating, in a way, in Japan (where the camera was constructed) had travelled from Vilnius to Poland and back to Vilnius and were now experiencing a strange homecoming. Two days later, we were cracking open a bottle of Wódka Żołądkowa Gorzka, and looking at footage from the 60s projected onto the wall of Warsaw Bauhaus. The projection was followed by Kristina Skaldina „sculpting the moment“ whereby at interval moments we were asked to close our eyes and observe our bodies, which sparked a lively discussion, followed finally by a film by Jamie Kane documenting the intimate process shared between three friends – an artist (in this case the filmmaker) and two actors, asked to perform and improvise a series of actions. Thank you to Warsaw Bauhaus for hosting us and to Adi for introducing us to them. Warsaw – see you soon!